In the past few years, podcast popularity has steadily risen giving many—including your very own SoundGuys crew—the opportunity to experiment with the medium. This uptick in podcast accessibility opened the floodgates for DIY podcasters, creating a demand for plug-and-go microphone like the cardioid Beyerdynamic Fox USB mic. Who is this USB microphone for? You’re going to want to prop the mic up close to your mouth in order for it to fully register the timbre of your voice. Podcasters. Whether you record from home or fancy yourself a coffee shop vagabond, the Beyerdynamic Fox USB Mic is a pleasure to use. You’re given great features like zero-latency monitoring via the headphone jack, onboard mixing, and a mute button. Musicians. Alternating between low and high gain settings directly via the mic makes recording different instruments a breeze. For instance, if you’re working on vocals, you’ll likely opt for the high-gain setting, but a guitar or bass solo may require you to switch to the low gain mode. This should help when mixing, which you can also make basic adjustments with via the top knob. It’s also much easier to compress or amplify 24-bit audio in post without adding too much noise. Gamers. If you’re one for gaming and need a high-quality mic to communicate to your teammates, the Fox has your back. It easily registers vocals, and if your voice is being relayed too quietly, just use the switch on the back to go from low gain to high gain mode. 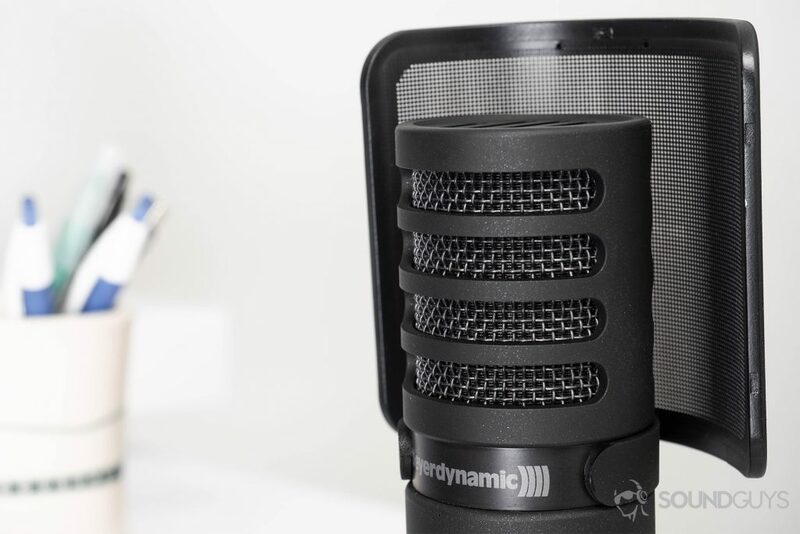 Beyerdynamic includes a Fox-branded pop shield that wraps around the large condenser capsule; an orange USB-C cable; a desk stand with a ring mount; and a ⅝” – ⅜” adapter. The packaging itself is padded, allowing the mic and its accessories to rest snugly inside. Plus, you can easily mount it to a mic arm via the aforementioned adapter. What is the Beyerdynamic Fox USB Mic like? There’s no false advertising here; this is a simple, well-built USB microphone that—by its very nature—is portable. Immediately upon removing the mic from its packaging, you feel the Fox’s heft. 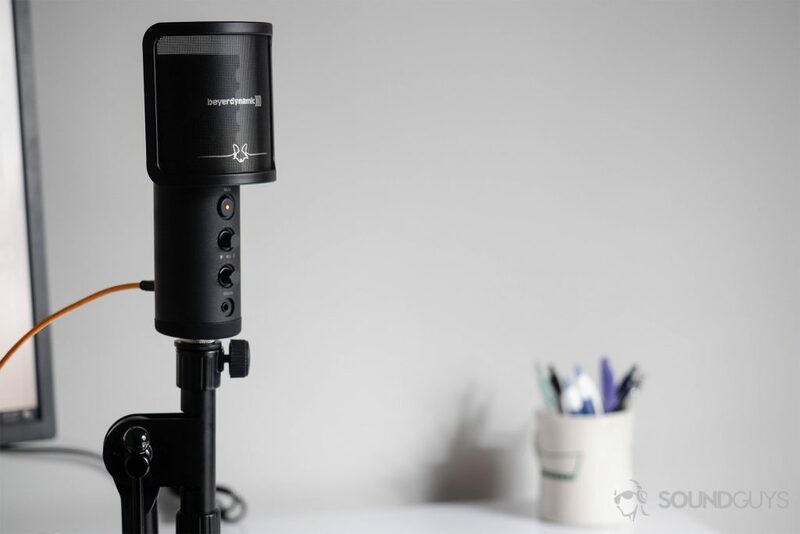 The one-pound metal microphone looks and feels professional and features rubberized material on the bottom to prevent sliding. Keeping things simple, the Fox has two inputs: one for the USB-C cable on the back and another for a 3.5mm headphone input, allowing for zero-latency monitoring. The Beyerdynamic Fox USB Mic uses USB-C for data transfer. Adorned with a mute button and two knobs—the top for live monitor mixing and the bottom for headphone volume adjustment—the front of the mic provides plenty of functionality. To attach the pop filter, align its collar to the Beyerdynamic logo and push until hearing a snap. Removal is just as easy, and having the filter installed makes a marked difference by protecting against the sudden increase in sound pressure from plosives and fricatives (p, b; f, s, sh noises respectively). Because we tend to speak closely into the mic, the power from those letters can clip the recording. Thus, a pop filter breaks up the abrupt increase in force, potentially saving your recording—or at least a few segments of it. Shielded by the filter, the capsule is a large diaphragm condenser with a pressure gradient transducer inside. Though you can easily get lost in the verbiage, this means that the mic has both sides of the diaphragm exposed and will respond by registering lateral noises accordingly. As you’d expect from a USB mic, this one must be plugged in to operate. The large diaphragm is great for capturing audio within the microphone’s frequency range of 20Hz-20kHz. As far as audio quality is concerned, the Beyerdynamic Fox USB Mic separates itself from competing USB microphones like the Samson Go by touting its studio quality recording abilities. You can record 24bit/96kHz audio with this mic, which is more than enough for most use cases. What’s more, this is a notable improvement from the Fox’s main competitor, the Blue Yeti, which records 16bit/48kHz audio. Are the onboard controls useful? Mostly. Alternating between your computer’s signal and your own recording signal is useful depending on your workflow. Since most of my audio recording is an isolated act, it didn’t do much minimize wasted time. If your process is similar: you may want to opt for something that omits this feature, seeing as it will likely be more budget-friendly. The knobs are easy to adjust and feel sturdy. It’s unlikely that they’ll fall off anytime soon. On the bright side, the headphone volume knob and mute switch are more practical. Though, more often than not, if I needed to press the mute button, I was more likely to just pause the recording via the computer. For anyone who hosts interviews or just doesn’t record right in front of the keyboard, the mute button is helpful. Found on the back of the Beyerdynamic Fox USB mic, the low-to-high gain switch is easy to forget about. As a concept, it’s wonderful, but Goldilocks was right: oftentimes what’s best lies between two extremes. In the case of the Fox USB mic, an auto or “zero” gain setting would have been greatly appreciated. When testing, I found the low setting to be too low. It captured my voice at -35dB, nearly inaudible, and the mic was just two inches from my mouth. Then, switching to the high setting, bumped it up drastically, making post-processing a bit of a pain when alternating between the two modes in a single recording. Is it a good all-in-one solution for traveling content creators? Yes, if you can put up with its features being more of a hassle than a convenience. If you’re having trouble with the mic stand, you may find that it rests with greater stability when placed backwards. Though the 24bit/96kHz recording ability may seem like overkill, being able to record 24-bit audio is invaluable. Doing so makes post-processing much easier and gives plenty of leeway when you need to amplify something without having the recording suffer from excessive noise. Though the file size may be larger than you’re used to, it’s worth it every time. The higher the bit depth that you can record, the easier your mixing will be. Aside from that, the major selling point of the Fox USB Mic—and all USB microphones, really—is the ease-of-use factor. Additionally, it’s compatible with both iOS and Windows operating systems, so you can use it on your HP and then lend it to your Apple fanboy friend without complications. And, sure, the stand is virtually useless given the no-slip rubber footing, but it looks nice. Is the Fox one of the best gaming mics? Not only is it great for podcasting and music recordings, the Beyerdynamic Fox USB Mic can be used for gaming too. Though it’s rather expensive, the Beyerdynamic Fox USB Mic is a great choice for gamers with a flexible budget. Its cardioid polar pattern means that it’s best-suited for picking up sounds that are directly in front of it. That said, there is some leeway in the pickup pattern, allowing for off-angle sounds to still be registered. That way, you don’t have to be precise about placement, which is the last thing you want to worry about mid-deathmatch. You can get a similar sound from the coveted Blue Yeti microphone, but it tends to register off-angle sounds more than the Fox. For instance, when using the keyboard, all of your clicks and clacks will be heard by your teammates unless you’re strategic about the keyboard-to-mic placement. The same of which can be said for the ever popular Razer Seiren X super-cardioid mic. But in all fairness, both options are more affordable… the Razer being a sub-$100 gaming mic. The included adapter is ideal for connecting the mic to a mic stand. At the end of the day, it really just depends on what your priorities are as a gamer. Are you like me and working with a shoestring budget but still want something that will last? In that case, you may decide to go for the Samson Go. Then again, if you’re wallet is really hurting, the Soonhua Condenser Microphone can be had for just $14.99. Why buy the Beyerdynamic Fox over the Blue Yeti? Both options are USB mics, but the Yeti is more affordable, just as portable, and sports a similar build to the Beyerdynamic Fox USB Mic. So, why should you buy this instead of the famed Yeti? Well, a few reasons. The Blue Yeti is available on Amazon for just over $20 less than the Fox. As was mentioned, the Fox records 24bit/96kHz audio, which is higher quality than the Yeti’s 16bit/48kHz audio. Maybe if you never make mistakes while recording, the additional bit depth won’t matter. But if you’re like the rest of us, mistakes happen; forgetfulness is real and having the leniency afforded to you by that extra bit depth can save you from a mind-numbing mixing experience. Live mixing. Although I didn’t find it to be extremely useful, there’s a chance that those with more intricate workflows, who work with more than one or two tracks at a time, will find this to be a huge time saver. It’s something that the Yeti, and many mics of this caliber, lack. Portability. Though the two mics weight about the same—500g for the Fox and 550g for the Blue Yeti—the Fox is more compact. It’s easy to remove from the stand and toss into a bag, but the Yeti’s design is more obtrusive. It’s like the Fox sits on the bus with its legs crossed with the Yeti is spreading across three seats. The mute button. Yes, both USB mics have a mute button, but multiple users have complained of the Yeti’s obvious click while recording and of how it often takes a few presses for the mute to toggle. On the other hand, the Fox’s mute button is easy to click and is hardly registered by the recording. Now, with all that said, there are a few reasons to still go in for the Yeti. For one, you have multiple polar patterns at your disposal: cardioid, bidirectional, omnidirectional, and stereo. When you invest in the Fox, you don’t have as much versatility when it comes to polar patterns; this is a cardioid-only USB microphone. Should you buy the Beyerdynamic Fox USB Mic? 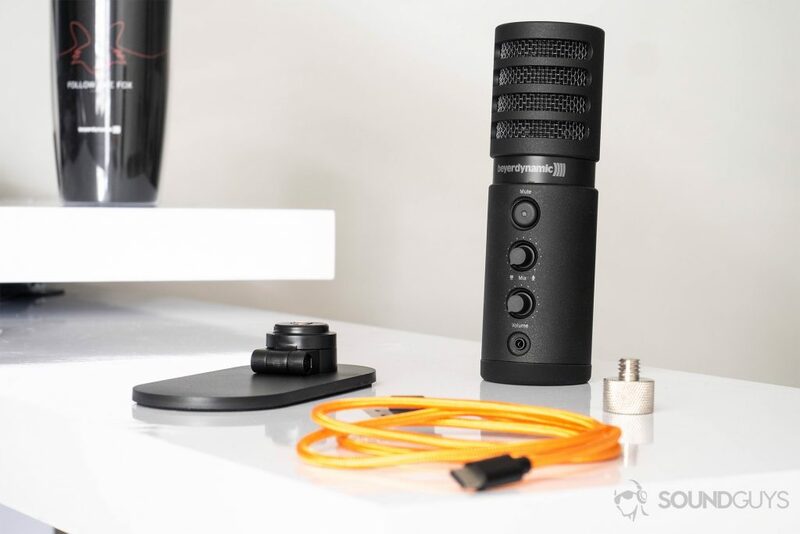 If you prioritize audio and build quality, then you should buy this portable mic. Its ability to record 24bit/96kHz audio is a great feature that its main competitors lack, and the confidence-inspiring metal build looks great on a desk or a hotel end table. An overlooked feature, the bright orange cable, is a plus. It’s easy to spot, which is great when you’re sifting through a suitcase that’s bursting at the seams. With a plethora of options in the USB mic market, the Beyerdynamic Fox USB Mic is an excellent option for those who want excellent audio quality without sacrificing build or usability. Though I didn’t find the live monitor mixing to be of great value, that’s not to say that others won’t. For those who have more complicated workflows, this will be a great time saver that anyone can learn to operate with just 30 seconds of explaining. What’s more, though the gain toggle isn’t all it’s cracked up to be, it’s an appreciated feature that shows Beyerdynamic and its designers are responding to what consumers want to see in a versatile, on-the-go mic. That said, if you are still on the fence about the Beyerdynamic Fox USB Mic, then there are plenty of alternatives. As was mentioned, the Blue Yeti is a superb option that’s similarly priced. Its construction quality is like the Fox; though I wouldn’t say it’s as sleek. The only real drawback is that it records lesser quality audio. However, that’s mainly useful for flexibility in post-processing. After all, most final products—be it a podcast or a song—are released as MP3s, so the initial recording quality will remain a mystery to most listeners. Wherever music is created, beyerdynamic microphones and musicians go hand in hand. On the world’s largest and smallest stages and studios, the new USB Studio Microphone FOX captures music anywhere, anytime. No melody will be lost because your studio is always with you. FOX can easily connect to a PC or smartphone via Apple or Android adapter. Record songs, podcast and much more with the according software. For home studio and mobile recordings, Singer-Songwriters, Vocalists, Musicians, Podcasters, Gamers and YouTubers to perform and create free of technical distraction.